Jump to results of the Dixon (NMDI) count. Jump to results of the Orilla Verde (NMOV) count. The Audubon Christmas Bird Count is the oldest citizen-based bird conservation effort in the Western Hemisphere. Each year, between December 14 and January 5, more than 55,000 volunteers count more than 60 million birds. There are more than 2000 count sites. Each count site is a 15-mile diameter circle. Dixon (NMDI) is one circle. Orilla Verde (NMOV) is another. 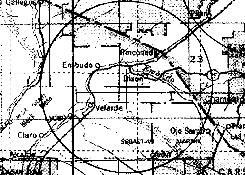 The center of Dixon's circle is just south of the Arroyo de la Mina about a mile from State Road 75. See map below. Enlarge Map The center of the Orilla Verde Circle is about 5 miles west of Ranchos de Taos. 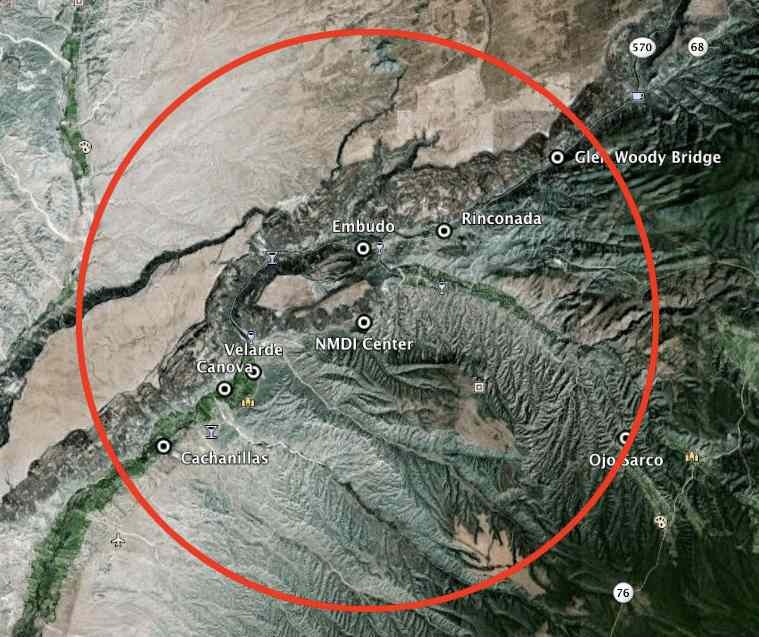 The circle encompasses all of Orilla Verde and Pilar, as well as the town of Carson and the west edge of Taos, including Baca Park. Some count circles in the U.S. have been in operation since 1900 when the first Christmas Bird Count was held. This year was the 21st year for the Dixon count and the 14th year for the Orilla Verde count. Overall, it was the 118th year for the count. Read about the History of the CBC. Go to the National Audubon CBC Website. Volunteers are divided into five or six groups. Each group has a leader who is capable of identifying every bird in the area by sight and most by sound. The group is filled out with less experienced birders. Even beginning birders can play a role as each set of eyes and ears increases the number of birds observed. Even beginning birdwatchers can participate. birders. Its a great way to get started! Yes! Even beginning birders are welcome on this count. Less experienced birders are matched up with more experienced birders. In fact, I got started birding by going on a Christmas Bird Count in Española in 1997. Some people do half a day, others the whole day. If you are interested in participating, please give me (Robert Templeton) a call at 505-579-4095 or email me at rt@rioembudobirds.org. Click here to see detailed results. Shows species and individuals for different locations. Thank you very much to the many property owners that allowed us to count on their lands! Without those permissions, the count would not be possible! Results from 1997 to 2018. Results from 1997 to 2018 ordered by how many years seen on the Dixon count. Results from 2004 to 2018. Results from 2004 to 2018 ordered by how many years seen on the Orilla Verde count. The Northward Expansion of the White-winged Dove in New Mexico along the Río Grande. The Dixon CBC began in 1997. However, the White-winged Dove (Zenaida asiatica) was not observed on the count until 2010. When a species is new to a count, the Regional Editor requests a "Rare-bird Report" detailing the observation. The table below shows historical data from New Mexico Christmas Bird Counts along the Río Grande Valley. These changing northern limits of the year-round range are shown on the map at the right. If you consult range maps in various field guides, you will find a great variation in the described breeding and wintering ranges. This is clearly a result of the rapidly changing distribution of the species. Range maps created before 1980 will show the year-round range reaching only about 50 miles into southern New Mexico (Just north of Las Cruces), with the breeding range extending another 10-20 miles north. Most maps produced closer to the turn of the century still show the year-round range barely reaching into New Mexico, but show the breeding range reaching as far north as Albuquerque. This is the case for the original Sibley's published in 2000. However, when Sibley published his guide to the western birds in 2003, the range map had been updated to show the year-round and breeding ranges in Río Grande Valley to be identical. When the Las Cruces CBC was begun in 1975, small numbers of wintering White-winged Doves were observed. As you can see in the data, by the 1990s many birds were over-wintering and by 2000 the year-round population had exploded into the tens of thousands. The further expansion north is clearly shown in the data. Though the Albuquerque and Santa Fe counts have been active since the early 1960s, the first wintering White-wingeds were not recorded in Albuquerque until 1994 and in Santa Fe until 1998. As you can see, the first records in the Española CBC were in 2005. The Espanola count has been active since the 1950s. There is a new Peterson's guide out now with recently updated range maps. The new map shows the Rio Grande valley year-round and breeding ranges as being the same and reaching as far north as Santa Fe. Additionally it shows a major northward expansion of the breeding range on the east side of the Rocky Mountains into southern Colorado with the year-round range on the plains reaching as far north as Clovis, NM. What we appear to be witnessing is a range expansion being led first by migrants into new territory, followed by some over-wintering groups forming year-round breeding populations. In general, we know that the migration of birds is driven primarily by food. If there are changes in the distribution and/or migratory patterns of a species, it is likely that there are changes in food availability in the areas involved. If this is the case here, might it be related to changes in agricultural activity? Might climatic changes be involved as well? Wild Turkey recorded on the Dixon count in 2007, 2009 and 2012! Update (December 27, 2012): Wild Turkeys were recorded at two different locations on the 2012 Dixon Count. 14 were reported in Cañoncito and 5 more in Rinconada. About 20 Wild Turkey (Meleagris gallopavo) spent the winter of 2007 in upper Cañoncito. There were other sightings in Apodaca, El Bosque and Embudo. One Turkey in El Bosque was regularly observed throughout the summer of 2008. However, by the winter they had left. These birds usually live at higher elevations, but sometimes move to lower elevations, probably due to food shortages at higher elevations. The turkey usually roosts at medium heights in cottonwoods. They feed early in the morning in agricultural fields and orchards. Later in the day they may be difficult to observe as they tend to disperse into the Piñon/Juniper. 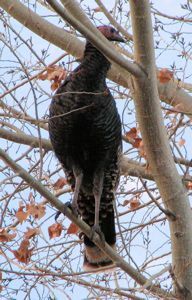 See more local pictures of Wild Turkey.